what you do with your evenings, how you spend your weekends, what you read, whom you know, what breaks your heart, and what amazes you with joy and gratitude. Rituals and ceremonies are a means for discovering and embodying new truths that allow our hearts to accept/embrace what we are experiencing. Many events prompt awareness of New Beginnings or Transitions: anniversaries, home blessings, birthdays, baptismal journey insights, times of gratitude for healing or recovery, spiritual highlights, occasions marking closures like divorce, occasions to make public your commitment (and wake up friends) to “heart concerns” such as caring for the earth or justice issues. It’s important to Celebrate Life! These occasions claim and honor: I am Alive, I am Valuable, I am Loved – and no one can take that from me! 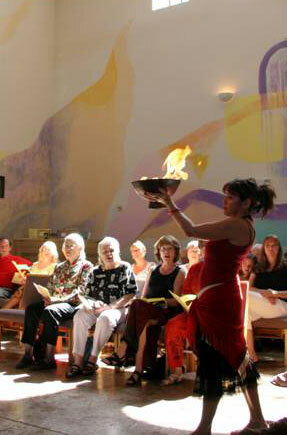 Creating Life Rituals and Ceremonies stirs up energy and Spirit. It creates vitality, meaning and joy by encouraging you to manifest the highest aspirations of your life. With decades of experience, Revs. Margareta Dahlin Johansson and Steve Harms will meet with you to discern the yearnings of your heart. We will create and facilitate a ritual with you that is grounded and graceful. Each Ritual is unique: It can be private, a gathering with friends or larger public events. You will feel charged and happy!